Miramar, Florida, United States, 2013-11-15 — /travelprnews.com/ — Spirit Airlines (NASDAQ: SAVE) today reported its preliminary traffic results for October 2013 and year-to-date 2013. Traffic (revenue passenger miles) in October 2013 increased 28.1 percent versus October 2012 on a capacity (available seat miles) increase of 28.6 percent. 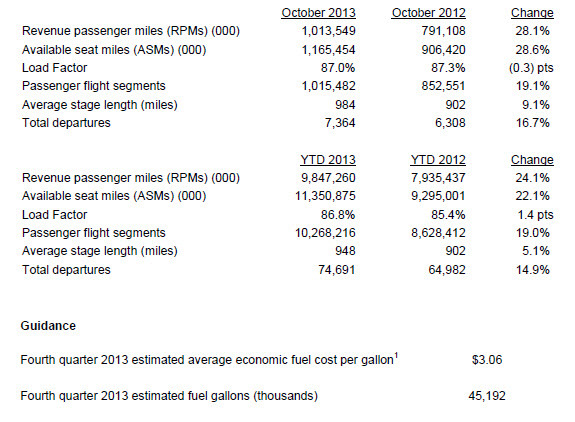 Load factor for October 2013 was 87.0 percent, a decrease of 0.3 points as compared to October 2012. Spirit’s preliminary completion factor for October 2013 was 99.9 percent. The following table summarizes Spirit’s traffic results for the month and year-to-date ended October 31, 2013 and 2012. Based on the jet fuel curve as of November 7, 2013. Excludes unrealized mark-to-market (gains) and losses which are comprised of estimated non-cash adjustments to aircraft fuel expense. The Company may have unrealized mark-to-market (gains) or losses in the fourth quarter 2013, but is not yet able to estimate the amount. Includes fuel taxes, into-plane fuel cost, and estimated fuel hedge (gains) and losses currently expected to be realized during the fourth quarter 2013. Spirit Airlines (NASDAQ: SAVE) empowers customers to save money on air travel by offering ultra-low base fares with a range of optional services, allowing customers the freedom to choose only the extras they value. This innovative approach grows the traveling market and stimulates new economic activity while creating new jobs. Spirit’s modern fleet, configuration and other innovations enable Spirit to burn less fuel per seat than competitors, making Spirit one of the most environmentally-friendly U.S. carriers. Spirit’s all-Airbus fleet currently operates approximately 250 daily flights to over 50 destinations in the U.S., Latin America and Caribbean. Visit Spirit at www.spirit.com. Statements in this release contain various forward-looking statements within the meaning Section 21E of the Securities Exchange Act of 1934, as amended, which represent the Company’s expectations or beliefs concerning future events. When used in this release, the words “expects,” “estimates,” “plans,” “anticipates,” “indicates,” “believes,” “forecast,” “guidance,” “outlook,” “may,” “will,” “should,” “seeks,” “targets” and similar expressions are intended to identify forward-looking statements. Similarly, statements that describe the Company’s objectives, plans or goals, or actions the Company may take in the future, are forward-looking statements. Forward-looking statements include, without limitation, statements regarding the Company’s guidance and estimates for the fourth quarter 2013, including expectations regarding revenue, RASM, load factor, capacity, fuel expense, economic fuel cost, expected unrealized mark-to-market fuel hedge gains and losses, and fuel volume. All forward-looking statements in this release are based upon information available to the Company on the date of this release. The Company has no intent, nor undertakes any obligation to, publicly update or revise any of these projections, whether as a result of new information, future events or otherwise, except as required by law. Forward-looking statements are subject to a number of factors that could cause the Company’s actual results to differ materially from the Company’s expectations, including the competitive environment in the airline industry; the Company’s ability to keep costs low; changes in fuel costs; the impact of worldwide economic conditions on customer travel behavior; the Company’s ability to generate non-ticket revenues; and government regulation. Additional information concerning these and other factors is contained in the Company’s Securities and Exchange Commission filings, including but not limited to the Company’s Annual Report on Form 10-K for the year ended December 31, 2012 and subsequent Quarterly Reports on Form 10-Q. This entry was posted in Airlines, Airports, Flights, Transportation, Travel, Travel Services, Travelers and tagged DeAnne Gabel, Misty Pinson, revenue passenger miles, Spirit Airlines, traffic results. Bookmark the permalink.